Ryan Flanigan is a songwriter, church music director (All Saints Dallas), and curator of new songs for the growing liturgical renewal movement in America. As an artist rooted in the Christian Story, Ryan works to create beautiful and believable sacred music for the sake of the world. He believes the Church can be a credible artistic witness of God's beauty, truth, and goodness to the whole world, not only Christians. Ryan’s melodies are accessible and rooted in the inherently joyful sounds of the American folk tradition. Nelson Koscheski is a poet, hymnographer, and retired priest in the Anglican Church of North America. 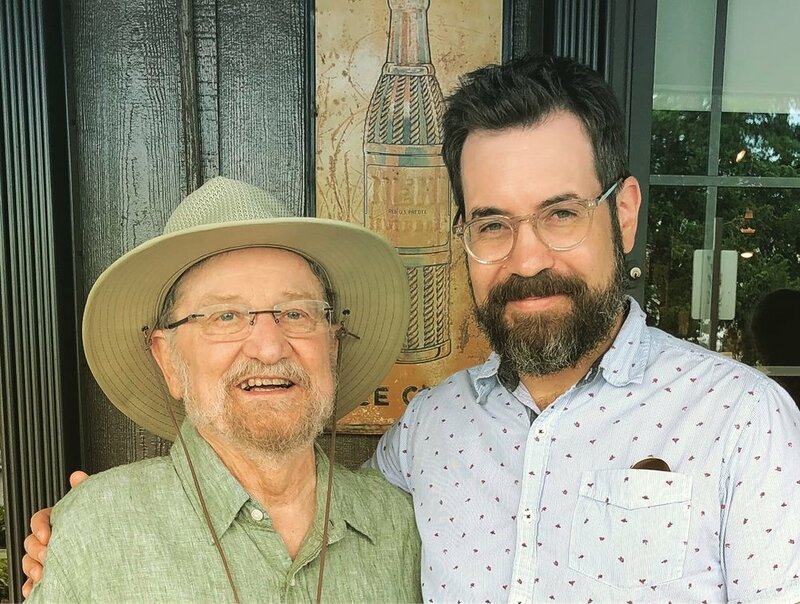 A lifelong Texan, Nelson's collaboration with Ryan began in 2015. Nelson’s poetry is saturated in his life experiences, West Texas imagination, and lifestyle of contemplative prayer, taking the listener through some of the darkest places of human despair into the presence of beauty, truth, and goodness. A month into his new job as music director of All Saints Dallas, an Anglican church in Oak Lawn, Ryan Flanigan received an email from a parishioner with the subject "Request." At first, he did not want to open it. "If you've ever been in church leadership, you don't like getting emails that say, 'request,'" jokes Flanigan. But the email did not contain any demands. Instead, it contained a poem written by a retired Anglican priest named Nelson Koscheski. Flanigan dutifully read it. "It was gorgeous," he says. He picked up his guitar, set the poem to a short folk tune and sent the song to an astonished Koscheski. "I was tickled pink," says Koscheski. "This guy can make a silk purse out of a sow's ear!" So began Liturgical Folk, a music project that centers around Koscheski's religious poems set to Flanigan's folk tunes. Since writing that first hymn in early 2015, Liturgical Folk has gained the support of producer Isaac Wardell, who has worked with many spiritually minded songwriters, including Sufjan Stevens, Sandra McCracken and Josh Garrels. Wardell produced Liturgical Folk's first two albums, which debut[ed] Feb. 1 . The hymns range from mournful lamentations to spirited carols. Many include language influenced by Koscheski's childhood spent on Texas ranches. Most wrestle with substantial themes such as sorrow and hope. The collaboration of Flanigan, [born in 1979], and Koscheski, [born in 1941], is also a unique cross-generational pairing of two men united by a belief that when music is honest and refined it can be a credible, positive witness for the church.